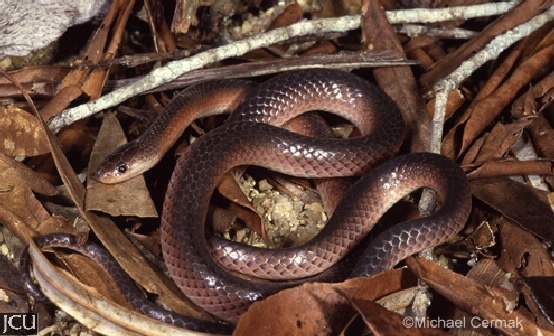 This snake is distinguished by the relatively large eyes and the broad dark brown stripe extending from the head along the body to the tip of the tail. This contrasts with the adjacent reddish to orange brown scales. The head is the same shade as the stripe; the belly is creamy-white. A nocturnal snake it favours rocky outcrops in woodlands and sclerophyll where it shelter under logs and litter. It preys on lizards chiefly skinks. Previously placed in genus Rhinoplocephalus.